I have re-made my blog so anyone, even people without Naver account may comment a page in Naver, where they are more likely to see. I am still working on this, but please bear with this state for the moment. So please come and comment about Webtoons freely here so Naver would see what you guys think of Webtoons! I would be glad if you link/or post copy of this in other sites! Click the Red Squared area. 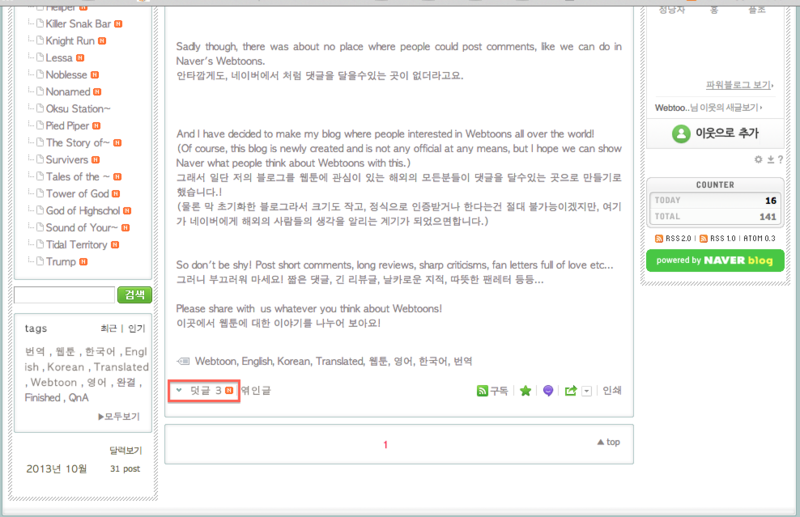 It says 덧글 (means comment) and you can comment there without logging in. Yellow box is where one can comment. Purple box says 답글 (reply), and you may use it to reply. It would show things in Yellow Box too. Edited by Random-Webtoon-Fan, 23 October 2013 - 10:21 AM.